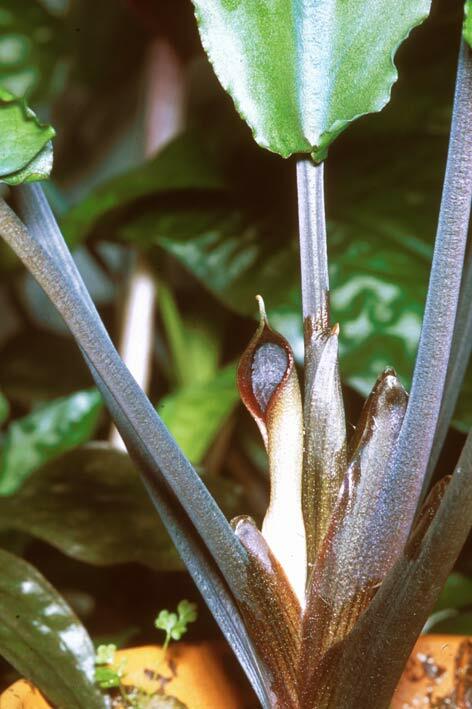 When in 1981, Serebryanyi described C. annamica from material collected by Orlov (a Russian herpetologist) he assumed that it was from the Ba Na mountains near Danang, where in 1927 Clemens collected a not flowering Cryptocoryne. It soon turned out that Orlov the plant had collected in the Gia Lai province and much effort was made by Hertel to find the 'unknown' Cryptocoryne from Danang. 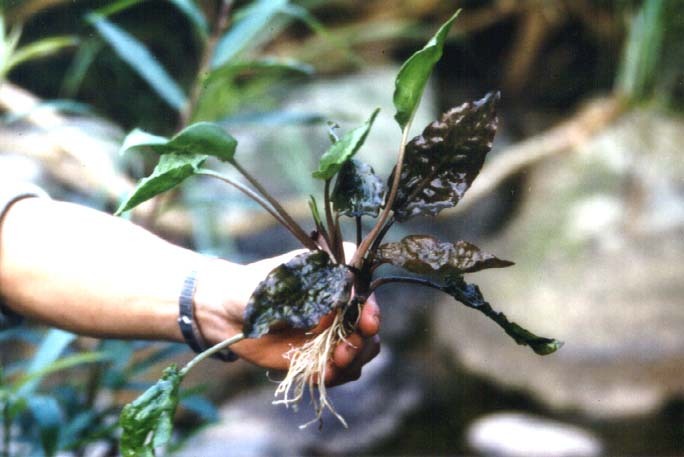 Live plants of (what should be named as) Cryptocoryne vietnamensis were first collected in 1991 by Ingo Hertel and Helmut Mühlberg. 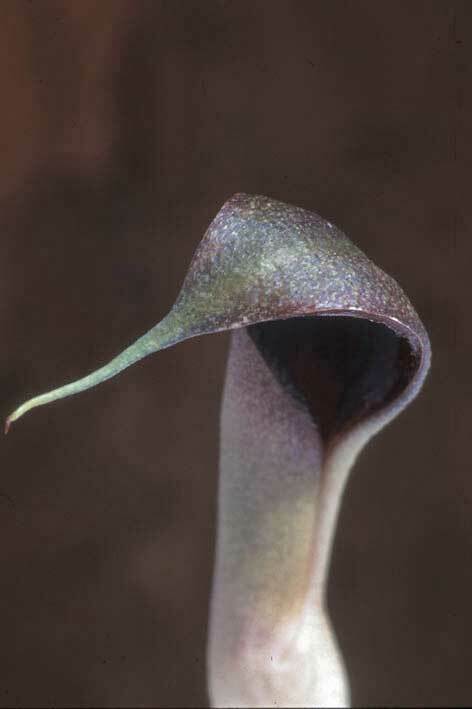 A emerged cultivated specimen of the type collection of C. vietnamensis. The leaves are bright green, both upper and lower side. 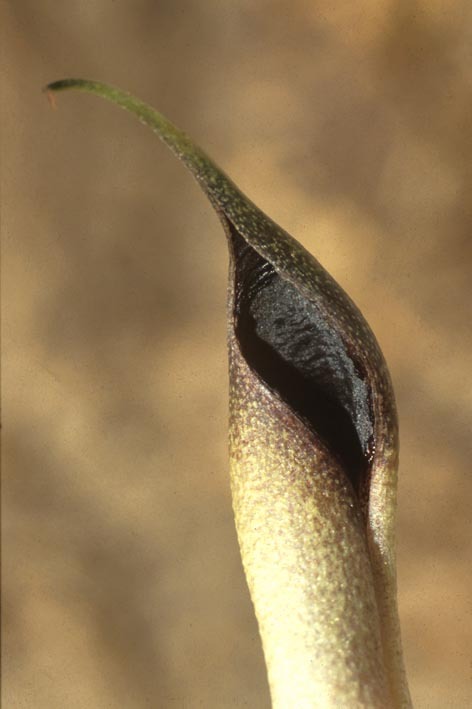 The spathe is small compared to the size of the plant. coll. Hertel 91-2, cult. B 695 A full developed spathe of C. vietnamensis has a short, pointed limb that bents down to a horizontal position. There is no collar, but the texture of the throat is different from the limb. coll. Hertel 91-2, cult. B 695 A close up of the forward bent limb of the spathe. This feature is also seen in more species, f.e. in C. elliptica. coll. Hertel 91-2, cult. B 695 A fresh opened, upright limb of the spathe. The limb of the spathe is a bit twisted in these specimens from the Thua Thien Hue province. NOTE. This photo is a part of a plate of ca. 1.2 Mbyte, click to see it. 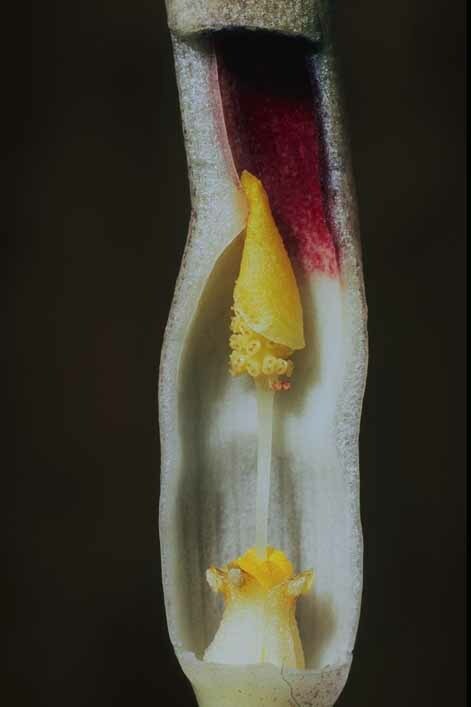 A wide opened limb of the spathe of C. vietnamensis. The throat reflects the light of the flashlight but is actually very dark. photo van Wijngaarden The petioles have a long sheath. Also non flowering plants may have a big cathaphyl. coll. Hertel 91-2, cult. B 695 C. vietnamensis showing the striking difference between emerged and submerged plants. Left an emerged, right a submersed specimen. 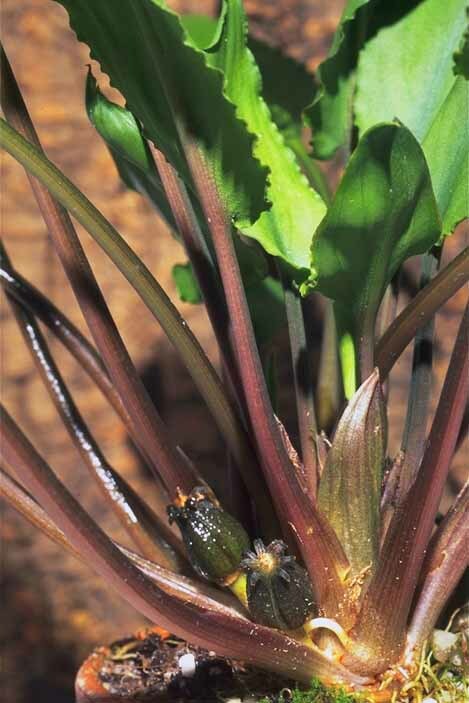 Bullated, dark green / brown leaves with a deep red lower side are also known from submerged grown C. annamica. C. vietnamensis is easy to grow. It flowers abundantly and sometimes fruits were set. coll. Hertel 91-2, cult. B 695 A length section of the lower part of the spathe. Note the red colour inside the tube and the slight constriction halfway the kettle. The downward bent styles indicate an 'old' inflorescence, also to see at the extruded pollen..
coll. Hertel 91-2, cult. 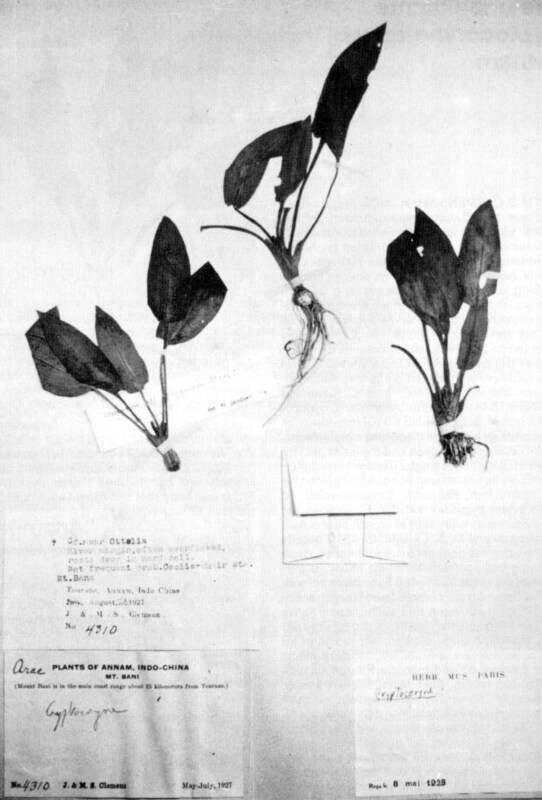 B 695 The famous herbarium sheet with a sterile Cryptocoryne. It is now identified as C. vietnamensis. 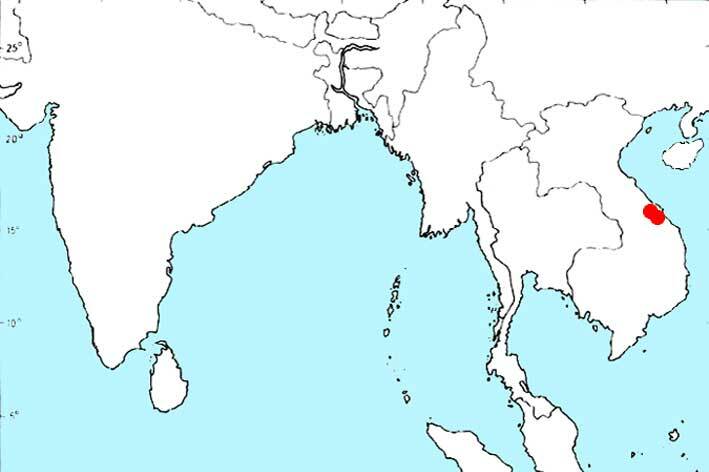 herbarium Paris Distribution of C. vietnamensis in Central Vietnam, near Danang. C. annamica grows more south in the Gia Lai province. 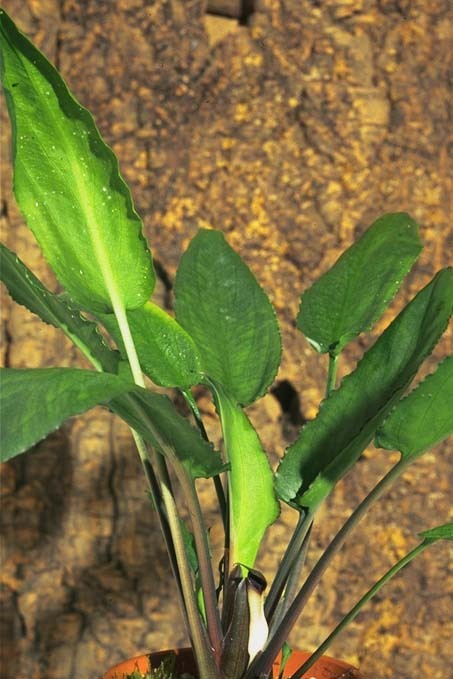 C. vietnamensis is easy to cultivate under standard conditions. 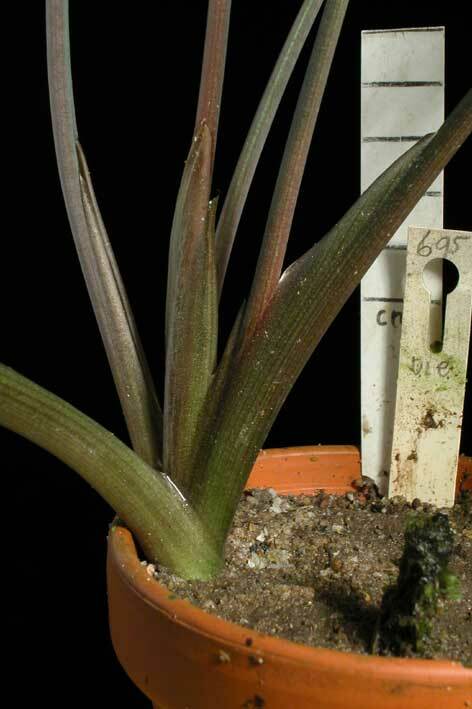 In an emerged culture C. vietnamensis has smooth, even coloured green leaves. In submerged conditions the plant should have dark green, bullated leaves with a red lower side. Reports from aquarists growing C. vietnamensis submerged are wanted! C. vietnamensis is a threatened species, The most recent information is that the area is growing popular for tourists. Only a few scattered stands exists. As the plant grows very easy, ask a friend for a runner! Note. 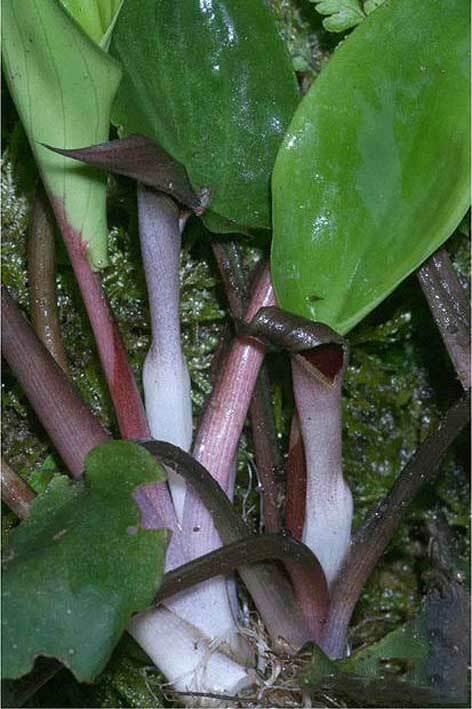 In 2007 there was a report of The Green Corridor Project on a newly discovered Cryptocoryne in the Thua Thien Hue province by L. Averyanov: C. vietnamica. This locality for C. vietnamensis is new. See the picture of Averyanov above. Bogner, J. & N.Jacobsen, 1984. Eine unbekannte Cryptocoryne aus Vietnam. Aqua-Planta 3-84 : 19-20. Hertel, I., 1985. Eine unbekannte Cryptocoryne aus Vietnam. Zum Beitrag von J.Bogner und N.Jacobsen. Aqua-Planta 2-85 : 19-20. Hertel, I. & H.Mühlberg, 1994. Cryptocoryne vietnamensis spec.nov. 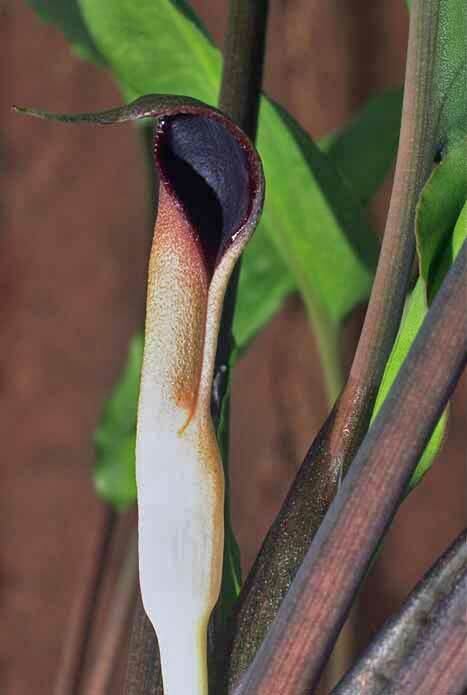 (Araceae). Aqua-Planta 2-94 : 76-81. Serebryanyi, M., 1991. Eine neue Cryptocoryne-Art (Araceae) aus Vietnam. Aqua-Planta 3-91 : 98-101.